DieselBike.net | Finding bad wiring connections on motorcycles and cars. DieselBike.net | Finding bad wiring connections on motorcycles and cars. A classic motorcycle restored from the ground up, no matter what its marque, is always a glorious sight to behold. But, for whatever reason, not everyone replaces every single part that they really should! There are always one or two bits that, well, with a little cleaning, might just do as they are. One item in particular that is likely to fall into this category is the Wiring Harness or Loom. Whilst the most competent of restorers may feel comfortable getting to grips with and re-using greasy and mangled wiring Looms, it's probably fair to say that even they are at a loss when the 'thing' does not conduct as it should. This can be especially annoying when the bike is a 'finished' project. Faced with either fitting a new Harness or finding the fault, I'm sure most, having tackled every other problem the bike could throw at them up to this point, would opt for the latter and get stuck in. But how should even the most accomplished of Sherlock's amongst us go about tracking down a fault that is intermitant and only occurs at the most awkward of moments? Armed with the motorcycle's wiring diagram and preferably a Digital Volt Meter (DVM), the intrepid restorer should don his Deer-stalker and begin by identifying the offending circuit and all its points of access. Next he should make sure the motorcycles battery is in good order and fully charged before turning on the ignition and making the relevant circuit live. Without getting overly technical, he should then, with the aid of the meter, attempt to find a Voltage Difference or Differential in the offending circuit. “The what?”, I hear you ask. Now this is not as difficult as it sounds! It merely means that a difference in Voltage will exist across the point where a connection is not 100%. Obvious stuff really, eh? This Voltage is small and will display in the milli-volt or mV Range on your meter. It will only occur if there is any degree of Resistance present. 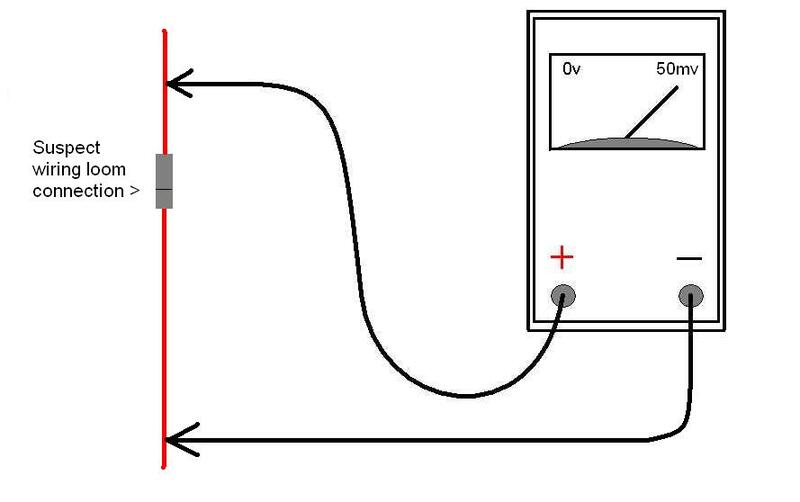 Setting your meter to a low DC Volts Range, place its probes either side of each connection in turn. With a pen and paper handy to note down each reading, simply work your way along the curcuits entire run, not forgetting switch and bulb connections etc. It's a very good idea to always start with the earth side. It is unlikely that you will find many perfect ( 0 mV ) connections on your old Loom but if you do then well done! In reality most will show a reading of several tens of MilliVolts, (i.e. 20 mV). Any connection that registers over 0 mV has the potential to be troublesome but with old Looms we have to make allowances. You should remember that you are basically looking for something out of the ordinary, a reading that is larger than any other. Find anything as significant as this and you have more than likely found your problem. Don't be concerned if your meter readings fluctuate between + and - as you do your testing. Just make sure your probes are firmly 'dug in' or connected every time. In reality it makes no difference which way round they are connected. Remember, any connection, crimp or earth point that shows up 'high' will only get worse under load. If you suspect a crimped Bullet connection, don't be satisfied with a quick clean. 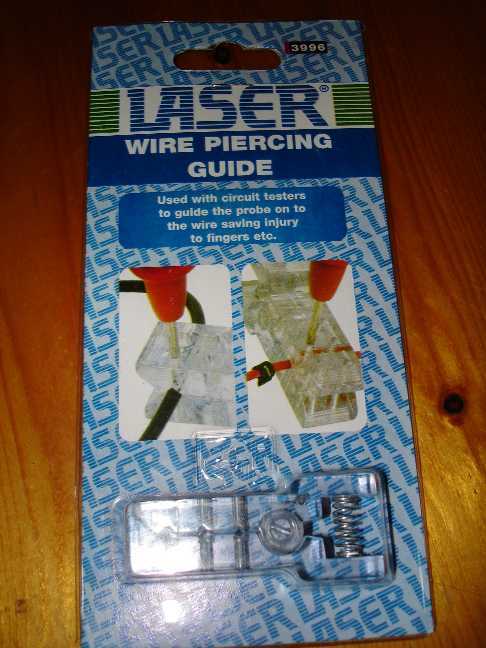 Chances are you will have to re-make it or better still, solder it. Never crimp onto black or tarnished wire. Main earth leads are not quite so easy to re-crimp or solder and should probably be replaced altogether. Here's a couple of instances in which this technique was used to diagnose some annoyingly persistant problems on a Honda 400/4. 1: The headlight of this (I must admit) partially restored machine began to fail when the engine reached anything over 7000rpm. I opened up the headlight shell and switched on the lights before putting my probes across every earth connection thereabouts. They all seemed alarmingly high, registering approximately 50 mV, but it wasn't until I straddled the last link, from the chassis to the lamp holder itself, that I got a reading of over 65 mV. I soldered the crimp and the problem disappeared. 2: The machine in question began to cut out with everything electrical failing. The next minute things would be fine. With the ignition on, one probe was attached firmly to the battery's Negative terminal while the other was connected to the chassis. A reading of 20 mV was observed across the Earth Lead. The lead was removed and its connecting points thoughily cleaned. A secondary reading was taken after it had been replaced. The DVM still displayed 20 mV or thereabouts. It was now obvious that the crimps on the Earth Lead were suffering from old age. A new Earth Lead cured the problem. If the electricity is finding it easier to travel through your meter than one of your connections then said connection may well be on the way out or breaking down under load. Ideally it should be re-made completely. All connections (particularly old crimp types) offer some resistance but if one in particular is high then that is likely to be the cause of your trouble. There are tools available to help do this kind of testing where you need to take measurements from either side of a suspect connector.